Use arrow keys to collect stars and rescue copters. Dodge obstacles and land on the spot. 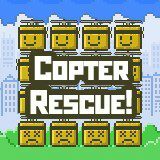 Have fun flying on your copter and save other copters inside every level. Just dodge obstacles, collect stars and land on the safe zone in the end.